Ad Review Mr Cooper's gave complimentary meal so we could review. No editorial control or request was given by them over this post. All thoughts and reviews are our own opinions. 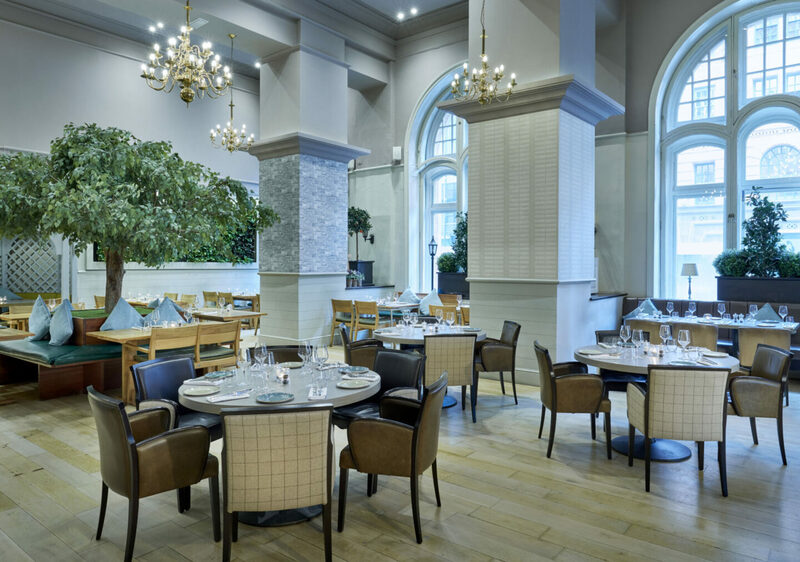 Based in the prestigious Midland hotel, Mr Cooper’s is a restaurant that offers a specialist menu in a contemporary home themed restaurant. STYLEetc went along to try the menu for review. There is a journey which happens as you make your way through the restaurant area. Coming in through the outdoor entrance, you are welcomed into a bar section which takes form of a library study. 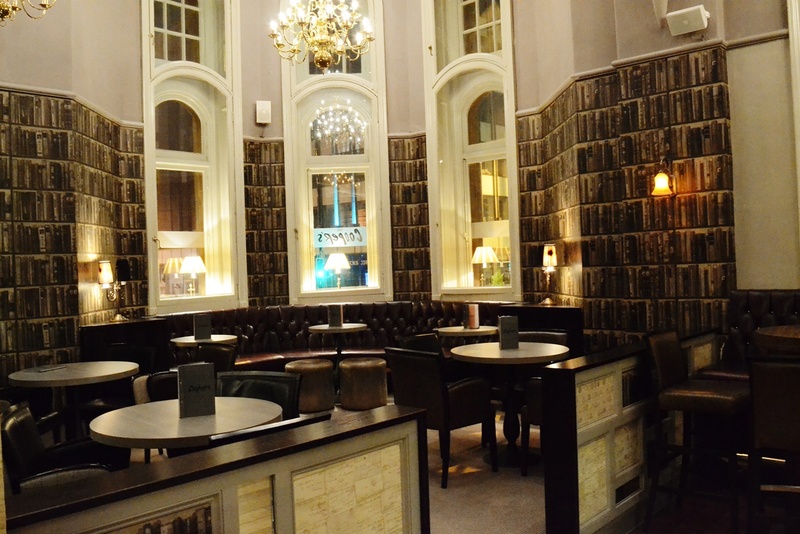 The wallpaper has fake book patterning and the furnishings is heaving on wood effect. Continuing on to the main restaurant, the decor shifts to resemble a home garden. The seats look like benches, faux-trees overlook garden tables. There are even lamp-posts overlooking some tables to really get a garden vibe. The colours complement the arrangement of trees and shrubbery with use of pale and neutral shades. 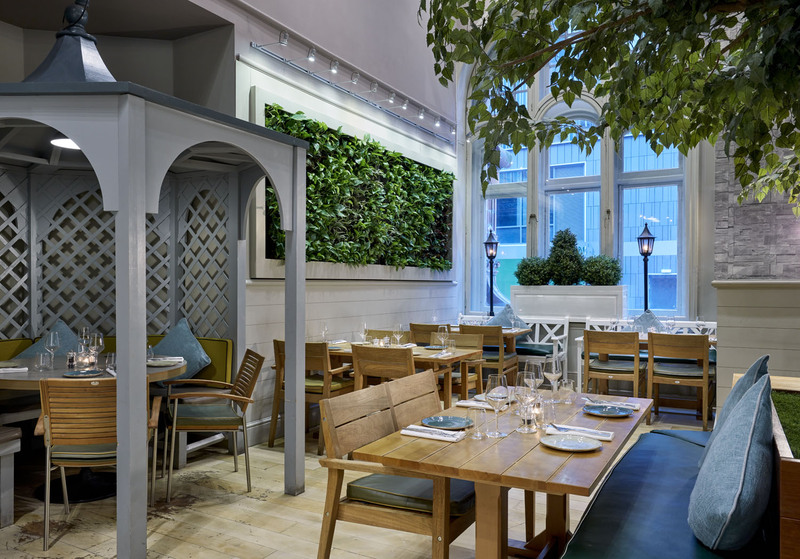 This additionally brings more light into the restaurant to achieve a contemporary look. We promptly ordered 2 cocktails to start; an old fashioned and an El Presidente. The bartender seemed to take pride in his cocktail abilities, which heightened our expectations. 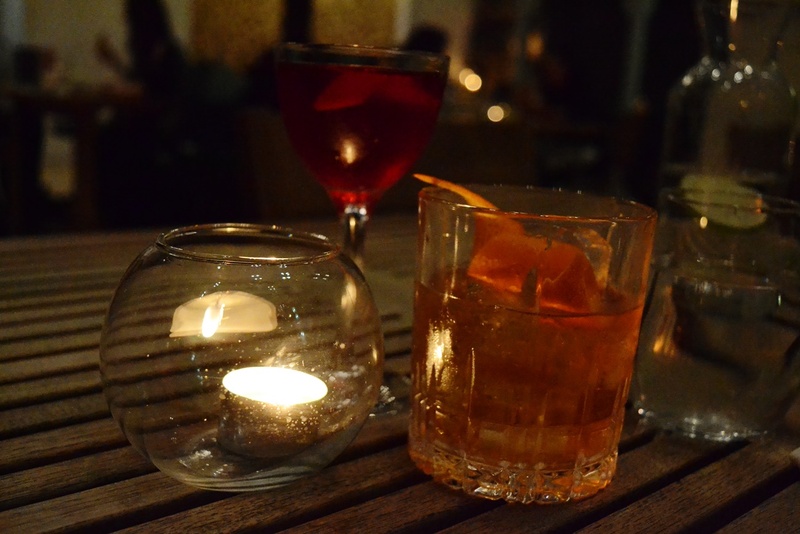 When the drinks arrived we were not disappointed, in fact the Old Fashioned was one of the best ever tried in Manchester. The bartender seemed to know this as he checked in later to see what we thought of the drink. 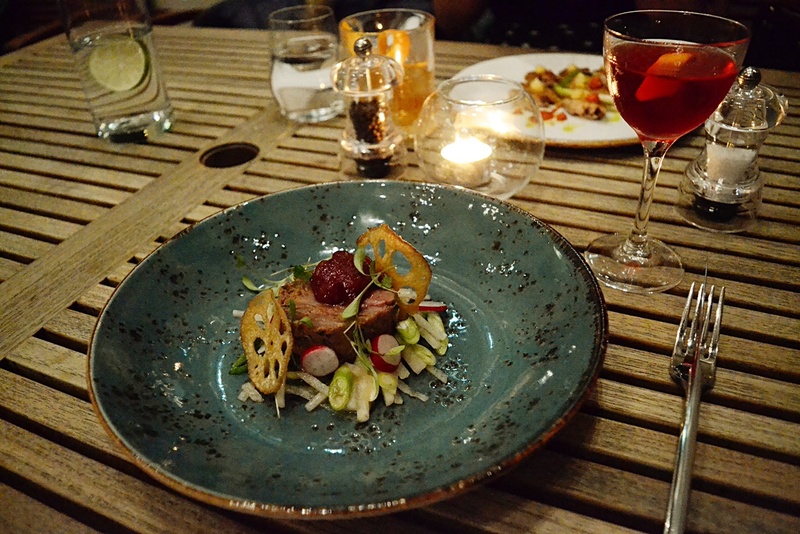 The El Presidente was also enjoyable, featuring fruity flavours to enlighten your palette for the starters. 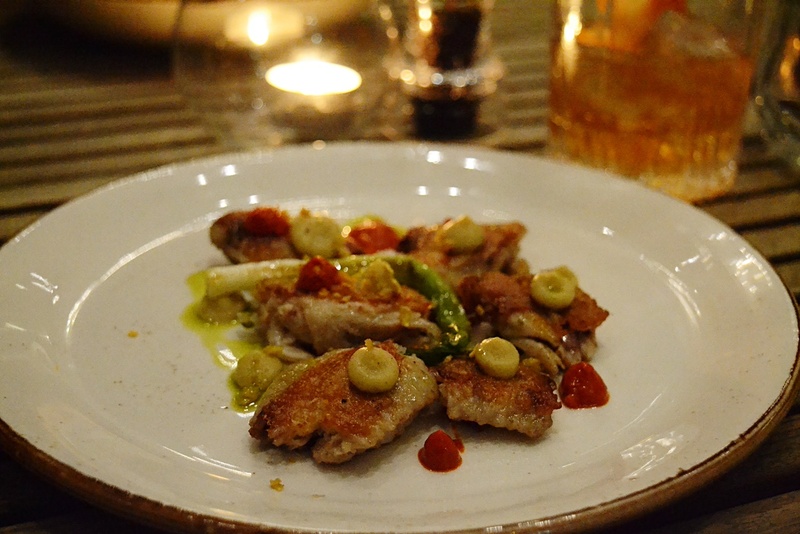 The starters included the Pressing of Goosnargh Duck and Boneless Chicken Wings. The duck offered a crisp outer, served cold. A bitter flavour was achieved with the plum, soy and ginger sauce which looked as good as it tasted. Similarly, the chicken also went down a treat, mixing a tougher skin and tender meat inside for a dimensional dish you can chew easily due to it’s boneless composition. Small dashes of harissa and chickpea added further flavour in an aesthetically pleasing way. For main, we opted for the Braised Beef Cheek and the Cumbrian Lamb Rump. The beef arrived well-done on the outer, served with mash, bone marrow crumb and baked beetroot. It may look crisp on the image but this meat was as tender as they come. The beef provided a truly melt in the mouth moment, with a perfectly balanced flavour that left you wanting more. The only slight irk was the beetroot which wasn’t to personal taste but fine if beetroot is your bag. 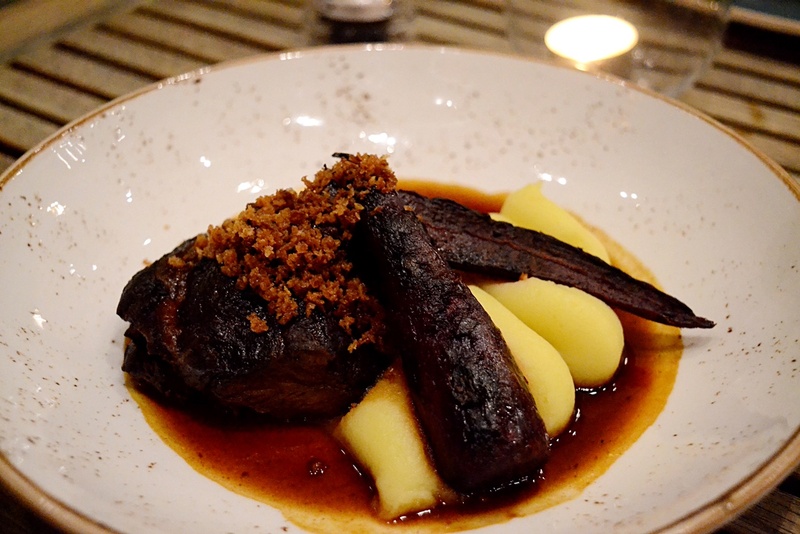 The Cumbrian lamb was a little tougher and chewy to eat, which was a plus as it provided a juicy flavour. The lamb was accompanied by spiced lentils, courgette and goat’s curd which proved to be a great blend of ingredients to make this a tasty main. 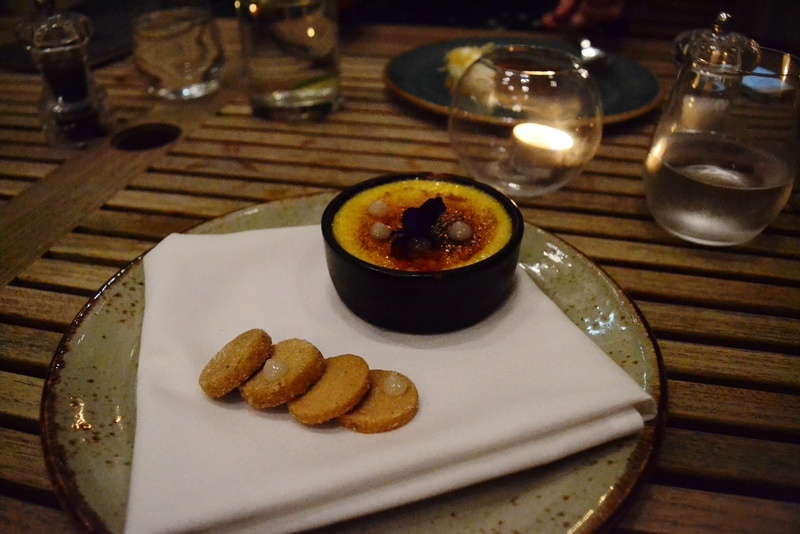 The desserts presented a tough decision, which ultimately resulted in a choice of the Mr Cooper’s Caramel Tart and the Kaffir Lime Brulee. 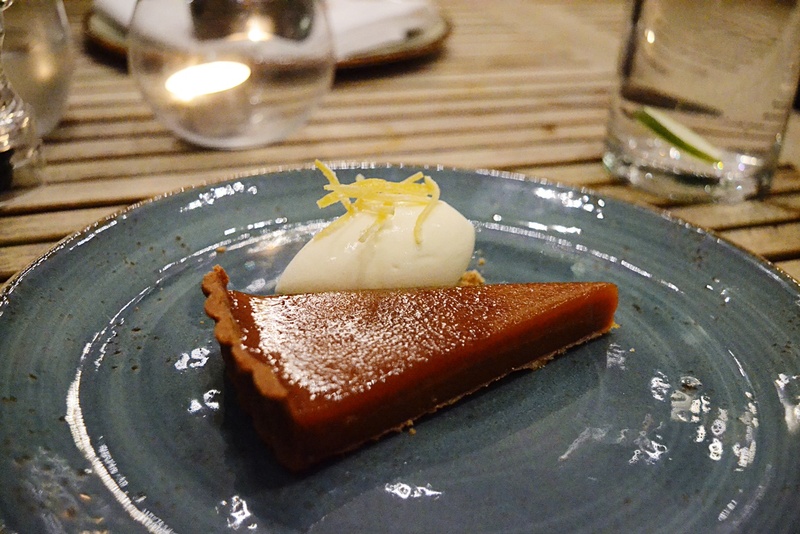 The caramel tart offered a sturdy and crisp base which gave way to an indulgently gooey top. mascarpone ice cream was additionally served on the side of the tart to provide an exceedingly good blank canvas to accommodate the other flavours. For the brulee, a dense cream inside was coated with a burnt sugar lid. This was served with a pretty decoration of flowers, with a side of mini rosemary shortbread biscuits to soak up the creme. At first the lime was a little overpowering, bringing a zesty taste that may not be for everyone. We found as the dish went on this flavour subdued over time to give just a subtle hint which was more preferred and made this overall a satisfactory dish. 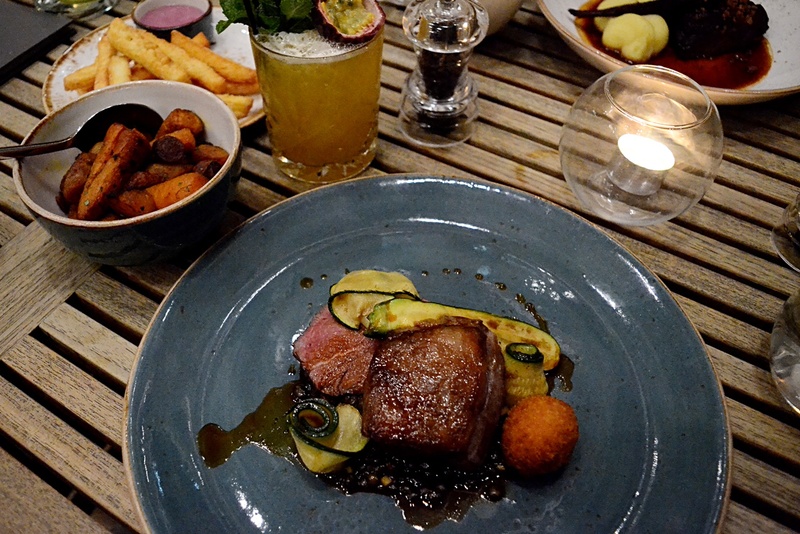 After a sampling of both the food and drink on offer at Mr Cooper’s we can honestly say it’s worth a visit. Not only was the food top notch, certainly worth the price tag within the mid-range, but also the service was truly great. The waiting staff never forgot about us and gave a balance of space to enjoy ourselves whilst being on the ball to whisk away unwanted crockery. Our food was served promptly and there was regular checking in to ensure we were enjoying our meal. Looking around, other guests also looked satisfied with their experiences and there was a nice relaxed atmosphere that allowed you to lose track of time easily . "Curvissa launches bridal collection online"